Despite its compact body, the FLITZ targets offshore game, including tuna and blue-skinned fish. It gains casting distance from its compactness and heavy weight, making it possible to aim and pick off a school of bonito some distance away. 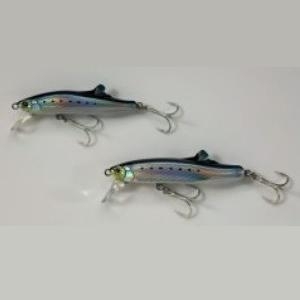 Other features are the outstanding iridescent effect provided by its tight wobbling action and flat sides, and its horizontal fall that lets the lure display a strong appeal from the moment of its entry into the water. The FLITZ. 24, with a diameter of 80mm, has been developed as a result of pursuit of action performance during low-speed retrieval, making it ideal for both sea bass and flatfish game fishing. Its major advantages are its bite-size silhouette and a casting distance that surpasses ordinary minnows.